Once again, a quick post. Here is a screenshot of the ISOs. Many other changes have also been noted in the beta. For example, the Windows Experience Index used to be till 7.9, now it is till 9.9! Stay tuned. 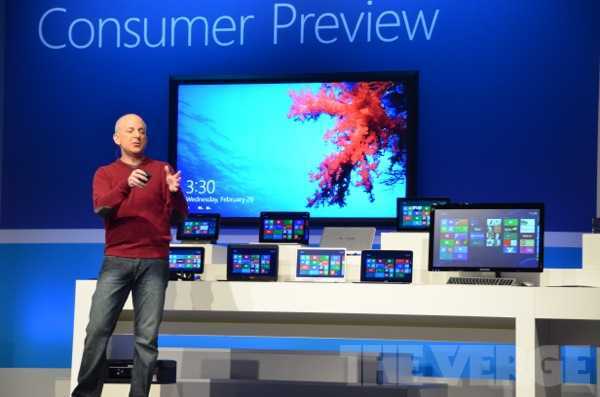 Windows 8 Consumer Preview ISO files (.iso) are provided as an alternative to using Windows 8 Consumer Preview Setup. If you are on a PC running Windows and want to install the consumer preview on another partition, another PC, or a virtual machine, we recommend you download Windows 8 Consumer Preview Setup and use the built-in tools for converting an ISO image into installation media, such as a DVD or USB bootable flash drive. You can find additional information, including a list of supported upgrades, in the FAQ. Note before you download: Windows 8 Consumer Preview is pre-release software that may be substantially modified before it’s commercially released. Microsoft makes no warranties, express or implied, with respect to the information provided here. Some product features and functionality may require additional hardware or software. If you decide to go back to your previous operating system, you’ll need to reinstall it from the recovery or installation media that came with your PC. Update Note: The ISO download links have been removed as the Final Retail version of Windows8 has been released by Microsoft. The easiest way to convert an ISO file to a DVD in Windows 7 is to use Windows Disc Image Burner. On a PC running Windows XP orWindows Vista, a third-party program is required to convert an ISO file into installable media—and DVD burning software often includes this capability. One option is the USB/DVD download tool provided by the Microsoft Store. You can also download Windows 8 Consumer Preview Setup, which includes tools that allow you to create a DVD or USB flash drive from an ISO file (Windows Vista or Windows 7 required).